The 2018 1oz Silver Koala from the Perth Mint is one of the year's most anticipated releases. Exquisite design features combined with limited mintages have made the Silver Koala one of the mint's most successful products. Additionally, the 2018 edition marks the first time that this beautiful Australian coin has been minted in .9999 pure silver. Each new coin in the Perth Mint's Silver Koala series is snapped up by collectors thanks to its annually changing koala design. The coin's reverse features the Koala Bear, an Australian native and a much-loved symbol of the country while the obverse carries a portrait of HM Queen Elizabeth II. The koala was mistakenly labelled a bear by the first European settlers in Australia. Similar in appearance to smaller members of the bear family, these lovable creatures could often be seen clinging to the branches or trunks of trees. However, the koala is a marsupial, an animal that carries its young in a pouch, and its closest relative is the wombat. Its favourite food is the eucalyptus leaf and its natural habitat is the coastal regions of southern and eastern Australia. The Australian Silver Koala made its debut in 2007 as a .999/1000 pure coin. For 2018, the Perth Mint has increased the coin's purity to .9999 and mintage is limited to just 300,000. 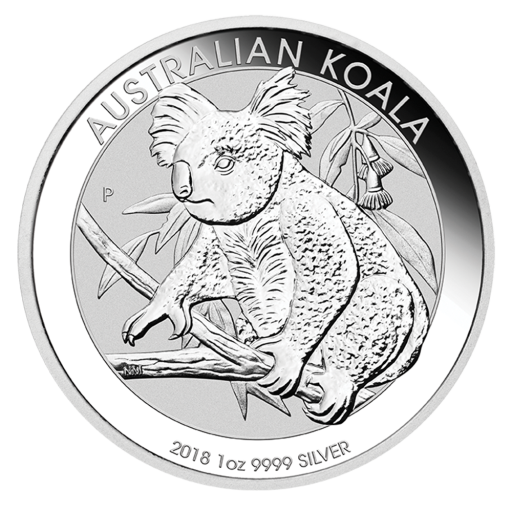 Its new 2018 reverse design shows a koala perched on a branch with eucalyptus leaves in the background. The words 'AUSTRALIAN KOALA' run around the top edge of the coin while the bottom border carries its weight, purity and date of issue, 2018. The 2018 1oz Silver Koala is a must for collectors and its inaugural year as a .9999 pure coin makes it a great choice for investors. Add the 2018 1oz Silver Koala to your portfolio or collection, quickly, conveniently and securely with coininvest.com. Coins are shipped in individual plastic capsules, as multiples of 20 in foil, or in boxes of 100.